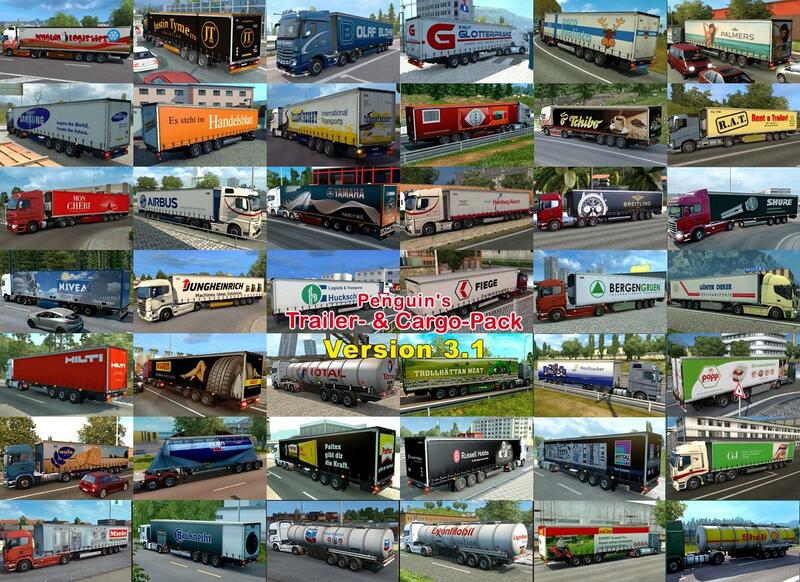 Credits: Basics are SCS trailers 'KRONE ProfiLiner', 'CoolLiner', 'Fridge', 'Fuel-, 'Cement-' and 'Food-Cistern', Rommi TZ Schmitz, MD-Modding Container and Fridge1, Matdom1988 Fridge und Fuel-Cistern, Fruehauf IceLiner from Niksari Elitesquad Modz and Fuel-Tank by Fred_be. Special thanks to KaLeu57, Brausetablette, Fr8i, sunrise, RudiRR, joberam and a smart swedish guy who didn't want to be named for their know-how support! 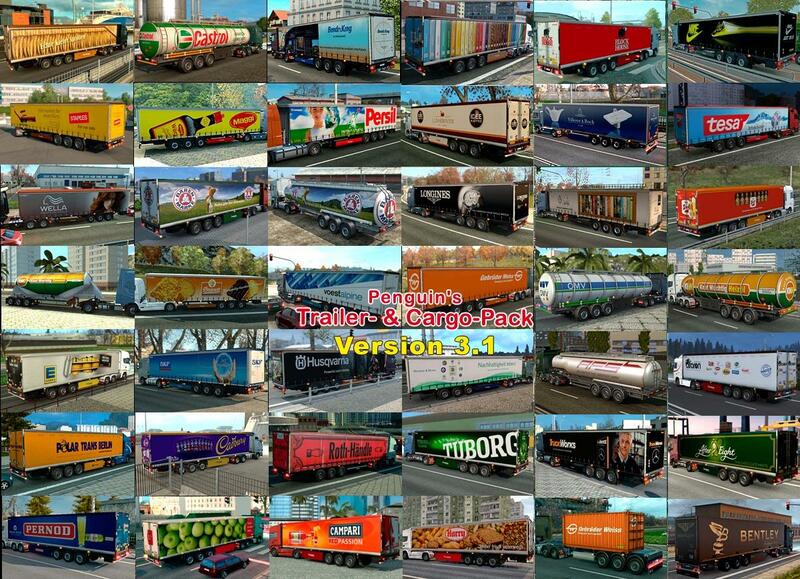 Edited with Adobe Photoshop, Adobe Illustrator and ETS2 Studio. CAUTION: Doesn't work any longer with <=1.26! 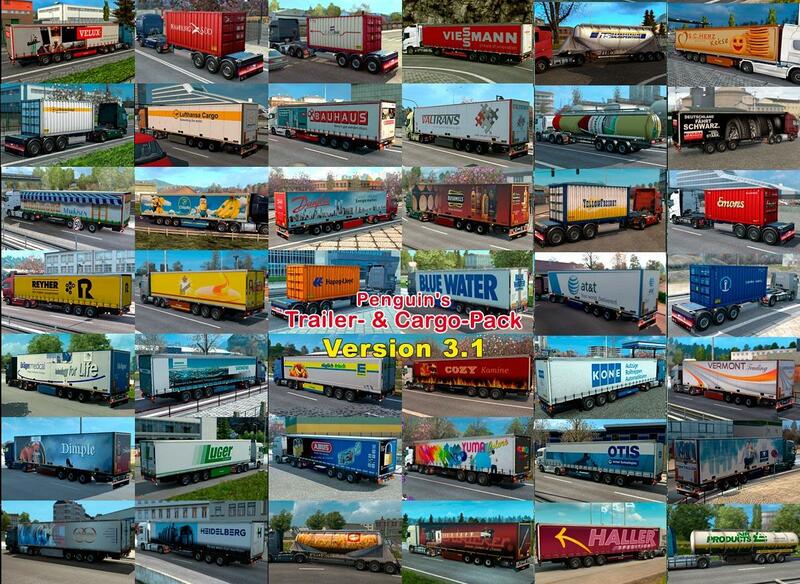 Version 3.0 contains 350 standalone trailers of 307 companies with adequate cargos. Sice I've removed again some old trailers, so CAUTION: After activatig my pack 3.1, you possibly will be set back to your homebase! So, maybe you should finish your running tour first! 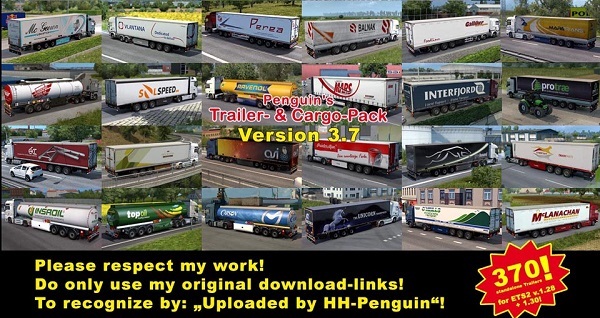 In case that in your last ETS2-session some ai trucks hauled any of my trailers of pack 3.0 which I've removed in 3.1, there will occur some warnings about 'dangling pointers' in your first gamelog after installing my pack 3.1. These will disappear in your next session. The pack consists of two 7zip files (001 and 002), which considerably reduces the amount of data to be downloaded! Opening file 001 enables you to extract the complete scs-file.